Hokusais The Great Wave (1831) has long been an icon image of the natural world he loved. I painted his  The Great Wave and brought it into the 21st century by painting it with acrylics and constructing the waves, Mt. Fuji, boats and people by using mosaic like ocean debris plastics collected from South Point Beach ( Ka Lae ), Hawaii. 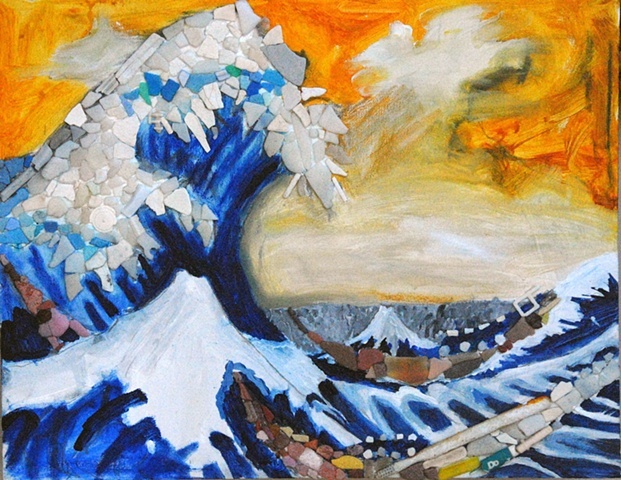 This painting was the logo and announcement card for my art and science installation at the Army Corps of engineers San Francisco Bay Model titled "Tsunami, The Great Wave of Plastic Pollution". Ocean debris plastics from the pacific gyre were released into the model.